At the moment I'm currently flipping back through every comic that held my wallet to ransom in the last year, to figure out my annual batch of NAD awards. 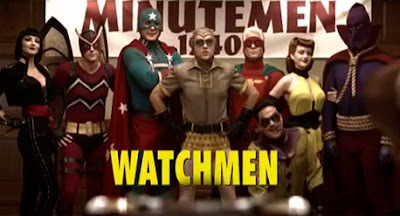 While the NAD's will be up next week, I thought I'd take a little moment to plug something that I think should've won allot more awards and acclaim then it did - the opening credits to 2009's Watchmen. One of the things most fans were worried about in adapting Watchmen, was how such an extremely detailed and layered plot could be shrunk down into one movie bite sized feature film. The opening credits not only allayed this fear for it's duration, it perfectly set the feel of the movie, it's theme and the generation in which it was set. I complete agree. It might just be the best opener for any film I've ever seen! Thanks Jimmy - I agree, I think it might be one of the best I've ever laid eyes on too. Plus I'm just glad I'm not the sound of one hand clapping! Snyder is great at opening sequences that grab you and really throw you into the world of the movie you're about to see (he did this also with Dawn of the Dead). I love when Silhouette kisses the nurse on VJ Day, screwing with an iconic American image--you immediately knew this was an alternate world you were entering. i've never been a big Watchman fan. it had it's moments but over all it's not one of Allan Moore's better writings. but i have to admit they did a good movie adaptation of a very large and complicate story line. the intro to the movie was done especially well. so i can at least appreciate the film from an artistic stand point. Thanks Rob - I thought that scene in particular was familiar for some reason! I also like the way the type was used. Allot of thought obviously went into every scene - so looking forward to what he does on Superman! Glad you like the credits too David. I think Watchmen reads allot better at the time then it probably does now. The content and tone were pretty fresh to me at the time in a comic and I think it definitely helped birth Vertigo.